I wasn’t raised with a religion… so I first learned about redemption via recycling PSA’s.The word had a very narrow definition associated with keeping streets clean and something about saving the planet. Minds like mine depend on metaphors for meaningful analysis, so for me, when the older definition of redemption started making appearances in the books I was reading, ‘Heaven’ looked like an ally full of semi-deranged homeless men, broken by war or addiction, bowing under massive wings, collecting 5 cent souls out of cloud lined garbage cans. God’s grace looked like the dingy depository; sorting conveyor belts stretching into infinity. A priori knowledge is a tricky thing… especially when you’re a poor kid with a brain like an accordion. Valentine’s day has come and gone. And this year I made no promises, broke no vows, and kept myself mostly to myself, but as I’m walking the lake with my 4-legged BFF, we come up to the most beautiful trash receptacle I’ve ever seen. This trash can is on the exit I take from the lake to my street. A marker. Turn left, go up a hill. My place. 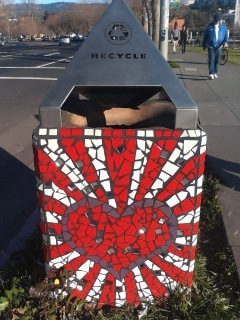 “Recycle my heart” is what this says to me. Yes, please. Can I deposit the heart I’ve got, the love I’ve had, the love that feels used and spent and maybe having outlived it’s original purpose can be melted down and a new heart will appear? Maybe the structural integrity of my heart has been compromised, but the essential ingredients are still precious. How much is copper going for right now? What is it’s redemption value? How many ways can a steel heart be refashioned; made lighter with each trip up the conveyor belt? Just keep my love out of the landfill. Keep my love circulating. Don’t let me be lazy and throw it away.